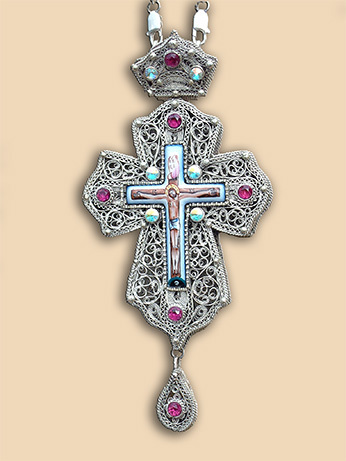 Pectoral cross in silver filigree with hand painted miniature icon on enamel of Jesus Christ with red corundum stones and Swarovski crystals. Part of a set which includes panagia PN010 and bishop's staff ZL003. Material: silver 950, enamel, red corundum, Swarovski crystals. Technique: filigree, granulation, hand miniature painting on enamel, stone setting. 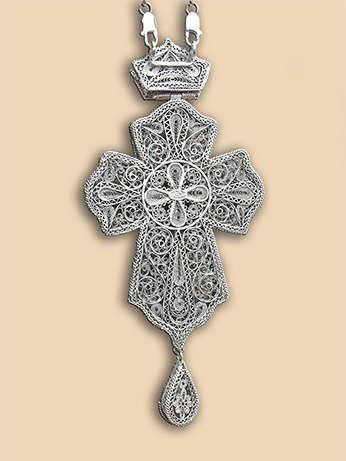 Size: 16.5 ×8.2 cm, chain 120 cm. Weight: cross 125 grams, chain 72 grams.